At Living Phit, we advocate for healthier living by alkalizing your body and losing weight. While you’ll find we endorse many products and methods on this site, such as the Slow Carb Diet Full Disclosure: We earn a commission if you click this link and make a purchase, at no additional cost to you. , Alkazone Alkaline drops Full Disclosure: We earn a commission if you click this link and make a purchase, at no additional cost to you. , and AlkaCare pH Full Disclosure: We earn a commission if you click this link and make a purchase, at no additional cost to you. by Bioclinic Naturals, we don’t work with these companies. You’ll also notice a lot of the testimonials below referencing Yoli, with whom we are affiliated. The preponderance of Yoli testimonials below is not meant to suggest Yoli is the only product we recommend. 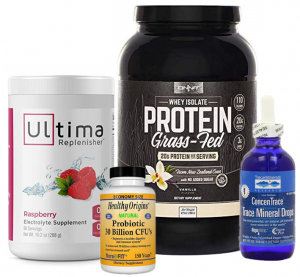 There are many great low carb diets and alkalizing products on the market, and we would encourage you to research your options, whether it be for dietary acidosis or weight loss, and select the product that best fits your specific needs. For our #1 recommended Weight loss and Alkalizing system, try our 30 day Phit Kit. I started with healthy food choices and Yoli around four months ago with a goal to lose around 10 pounds. I didn’t realize at the time the added benefits I would get. Not only did I lose 10 pounds in the first 30 days, but have reduced my Prilosec dose in half. I also was experiencing a sharp pain in my knee and could not kneel to pick up or play with my grandkids. That pain has disappeared and I can now enjoy playing again with the grandchildren. I have more energy, have lost another 3 pounds and am sleeping better as well. My journey started on January 18th after much persuasion by my great friend/ coworker Jaye. At first I was very skeptical, I didn’t think healthy food choices and Yoli would work for me. After three weeks of no success, I was ready to quit. Luckily, I didn’t quit, but tweaked some of my daily food intake. Not long after that I was amazed, my skin looked better than I could ever remember, my clothes were starting to feel loose and my energy was shifting. I learned I actually have self control and willpower, which I had previously lacked. Six months later I’ve lost 38 pounds and gone from a size 12 to a size 6. I feel great and my self confidence is back! I can’t thank Jaye and Yoli enough for helping me reach optimal health. When I first heard about the high alkaline diet I was really skeptical. I’d tried so many different things to help me lose weight. I started on my first T-Kit at the end of June 2014. I immediately started to feel more energy and mental clarity. After 10 days I got to cut me blood pressure medicine in half! At that point my goal changed from losing weight to getting off ALL my blood pressure meds. I’m now in week six and on my second T-Kit and using Truth and Fun. I’ve lost over 18 pounds and 14 inches. Also my thinning hair is thicker, my eczema is gone, my constant heartburn is gone, and my pain is gone. I actually didn’t realize how much pain I had until it was gone. I believe that every person is different and will have different results and successes. But one thing I think is true for anyone doing positive dietary choices and Yoli is how easy it is to follow. I’m 38 years old, and 5’5. (Personal Woman Issues Alert) (You’ve been warned) I have PCOS, Poly Cystic Ovarian Syndrome. What does that mean? It means a lot of really icky things go on inside my body. I do not ovulate, I have a tendency towards diabetes, my hormones are out of whack, hirsutism (excess hairiness- soooo grateful I’m a natural blonde!!! ), never ending acne and a myriad of other embarrassing symptoms. I was fortunate, and unfortunate alike, to be diagnosed when I was only 19-20 – as it is a very unknown disease. I have a web of cysts that cover my ovaries. Some women have it less drastically than others, but mine is severe. I didn’t start having cycles until I was 14 or so, they were never normal, and by the time I was 18, my roommates were concerned with my health and made me go to Planned Parenthood (not real doctors, by the way). All they did was put me on birth control pills to try to regulate my cycle. Well, after a few months, I was taking pills every day to NOT have a cycle. So, why take the pills? They didn’t really diagnose me with anything other than an irregular cycle. PCOS was virtually unheard of then. I was married in 1994 and desperately wanted a family. I took pregnancy tests every month, lots of them, because lack of cycle certainly meant that I was pregnant. It got to the point that I was hiding them from my husband because he couldn’t handle the disappointment. We never used birth control, ever, in hopes of conceiving. PCOS robs women of their natural God given honor to bear children. Over the past 20 years, I have tried a lot to “fix” the problem. Even after my divorce, I tried going to specialists, but it wasn’t covered under insurance because it was for infertility. That was a low blow because I wasn’t married, I wasn’t sexually active and I wasn’t trying to get pregnant at that time (and 15 years later, I’m still not married, still not sexually active and still not trying to get pregnant, yet the medical community still tells me it is for infertility). I simply wanted a fix. Which there isn’t one. I paid for my own medical tests. Mine came back within “normal” ranges. Which is crazy, because I NEVER had a cycle on my own. I went in for an ultrasound. My 15 minute appointment turned into an hour and 1/2. I finally asked them to turn the screen around so I could see what they were looking at. I have seen the web of cysts suffocating my ovaries. I’ve seen the lack of blood flow to my right ovary. I’ve seen that there are no kinks or twists in my tubes. I’ve seen it, but doctors could not explain it… as I said, It’s a very uneducated disease. What my doctors ended up doing was prescribing a medicine for me to take every few months to force my body to have a cycle. It was horrible. They were terrible and painful and lasted for weeks on end. So, as I’ve aged, I quit doing that too. I participated in a clinical trial in Portland a few years ago for an herb to help with PCOS. The other thing they do to “treat” it is to prescribe diabetes medication, because PCSO causes diabetes. I’m telling you this because of the heart break I’ve endured as a failure as a woman with a broken body. About 10 years ago, I made peace with it. It is a difficult realization to come to terms with….. that the one and only thing I wanted most on this earth was to bear my children. (Yes, I understand I can be a mother. I’m a great aunty. That’s not the point). The point IS – I started my new lifestyle changes in August 2015. In November I had a regular, normal, 5 day cycle… on my own. I thought it interesting and something to watch for in December. Lo and behold, in December, another regular, normal, 5 day cycle. Then nothing again until March. I quit using my Alkalete on a regular basis and the cycles stopped. Recently, I’ve started taking frequent doses again. Within a month, another cycle in July. It’s been almost a year taking Alkalete and my body has produced 4 cycles. 4 in one year, all without a doctor. My hopes for conception are very low because of my age, however, I want those 20 yr old women, struggling with PCOS to have hope. The only change to my life is the high alakaline diet and the Yoli Better Body System. I truly believe, no, I KNOW that Alkalete has helped my body to heal itself. My journey began out of desperation…. about 2 years ago on my yearly physical I found out not only were all of my blood tests not good, but my sugar was elevated to the point I was now pre-diabetic. I felt awful I had no energy. My joints hurt so bad it was difficult to walk. I could not sleep, my hips hurt so bad that moving became difficult, and I was dragging around another person, at 310 pounds. I had reached my limit. I had noticed a dear friend of mine Shirley Crippen losing weight and looking fantastic in her new profile pictures so I asked her what she was doing, she told me she was using Yoli and a high alkaline diet system. I asked more questions she invited me to watch a video which got me excited, but when I found out the cost I told myself I could not afford it and put it on the back burner. In March this year I went on a trip to Pismo Beach, California with my sister and my two daughters, to be honest I wondered at the time if this was going to be my final trip with them I felt like I was slowly dying and that is not an a lie. I felt that bad..they all went for walks on the beach went shopping and I sat most of the time watching the fun, too tired and in too much pain to do anything about it. I cried a lot that week scared to death or should I say scared of death! That was when I decided no matter what the cost I had to do something. About 10 years ago I was diagnosed with severe plaque psoriasis, so bad my back had huge scales and red spots the top of my legs were beginning to get bad, my scalp was covered and it was beginning to move to my eyebrows, elbows were covered and it itched like crazy. So this was another thing I had to deal with. As soon as I got home I contacted Shirley told her order the kit I am ready. I began my journey on April 11, 2014 and today my psoriasis is almost totally clear, I am not longer pre-diabetic, I sleep better than I have in 15 years, my joints no longer keep me awake at night, after my doctor visit in May I found out ALL of my numbers were in normal range in fact some of them were fantastic and I was NO longer pre-diabetic at that point I weighed 286 pounds. Today, I feel better than I have in most of my life I am at 256 pounds, I have more energy than I know what to do with I have one tiny patch of dry skin on one elbow and that is being OFF of the twice weekly injections of medicine I was taking for it. I now have a blood pressure which used to be 198/90 on meds to 120/63 off the meds. My body is healing itself and I feel it each day. I have been on a full Tkit since April and I will stay on it until I reach my goal weight of 180 pounds a number I have not seen since 1977. I will get there one day, one pound and one prayer at a time. Healthy food choices have given me my life back and I am so thankful for finding the courage to try it and the encouragement from my dear friend. The high alkaline diet and Yoli saves lives, I am proof! I heard about the high alkaline diet and yoli from a friend. I thought it was just a gimmick until I watched his body transform and his headaches disappear. I decided to take yoli for digestive health and weight loss. I’ve only been on yoli for about 5 days but I’ve noticed I’ve been sleeping better, I don’t drink coffee at all anymore, my smoking has dwindled from a pack every two days to maybe one cigarette every other day. I just don’t feel the need to drink coffee or smoke anymore. I’ve only lost about 2 pounds, but I have so much energy and I feel refreshed when I wake up. I have tried herbalife, I did that religiously for about 25 days. It worked, I lost weight, but there were so many pills and it made my ulcers flare up almost every three days. Yoli and herbalife are about the same price, herbalife just didn’t give me a refreshed feeling, and the tea (similar to yoli ‘ s passion) made me so jittery and some nights I got no sleep. Last summer a few of my friends had invited me to a Yoli Better Body Party, and it only took a couple invites before I showed up. I didn’t know what this new lifestyle thing was about but quickly, I wanted to know more. I didn’t even think about it and wanted to do try this new positive lifestyle and be a part of it. I started using the products and almost instantly (well okay, that first week!) noticed multiple differences. I was able to keep my sunny disposition much easier under the massive stress at work. I had more energy and got up in the morning ready to go. I was sleeping better and a more reasonable length of time. And after the first week, I stopped having headaches. I used to have migraines and was taking a lot of Ibuprofen to ease the pain and try to control the headaches. But I also started noticing that I didn’t have aches and pains in my body anymore! To be completely honest, I have not followed the food plan very closely, even though I have been taking most of the products on a daily basis. However, I had a MAJOR sugar addiction to kick and have made HUGE strides. My tastes have changed and I don’t have constant sugar cravings any longer. I’ve lost pounds and inches and am still in my “transformation” phase. But it’s not just the physical transformation- there is a great sense of an emotional and mental transformation that has also been taking place. I feel like I’m getting back to that “go-getter” that I used to be…someone I’ve missed for many years. But now, I’m becoming an even better version of myself, in more ways than one. I’m so thankful for my friends for introducing me to the high alkaline diet and Yoli and I am so excited for what the future brings! Prior to a low carb diet and getting on the Yoli Better body system I was tipping the scale at 437 lbs. I was diagnosed with a severe case of gout, and my blood pressure was 200/138 just a couple points shy of a stroke. Needless to say I was in bad shape. After using the better body system and implementing a high alkaline, low carb diet, I dropped fifty five lbs in the first two months but what really amazed me was I was no longer suffering from gout and blood pressures dropped to normal, I am no longer on the harmful pharmaceutical drugs and I can’t stop sharing this with everyone I meet! As a result of sharing this with everyone especially my loved ones I have been able to reach the rank of triple diamond executive and earn a multiple six figure income because of the simple system! I used to be an addicted soda junkie. I don’t consume coffees, or alcoholic beverages, but sodas were definitely a vice. My soda of choice was either Coke or Mountain Dew. I’d easily drink anywhere from 6-8 cans a day on average. I was definitely on the “fast track” to diabetes, along with probably other health issues due to my sugary addiction. When the high alkaline diet and the Yoli and the Better Body System was first introduced to me, I tried it because of all the health benefits it offered: detoxing, reseting your metabolism, and leaning up a little as well. What I didn’t realize was that I began to slowly replace my soda needs with the awesome drinks Yoli has, such as: Fun, Truth, and Passion. It’s a testament to their great taste, cause I had no issues slowly replacing my cravings with the drinks. I’ll admit, I have a soda on occasions when I’m out, but they’re no longer stocked at my home, and I’ve cut down my consumption by 95-98%. The best part is, I know this is setting a healthier example to our kids as well. I started my new healthy lifestyle and Yoli around 4 months ago. I heard about it through our good friends Angel and Tulane. After having my third child my body was not responding to losing weight. I tried running and work out videos. Nothing would come off. I was tired all the time and very hormonal. My skin under my wedding ring was peeling and bleeding, I couldn’t wear my ring. After looking into it I decided to try new positive dietary choices and Yoli. Couldn’t hurt at this point! During my 30 Day Transformation I lost 10lbs and several inches all over. My skin problem went away and I was feeling much better. More energy all around. People have been noticing and asking me what have I been doing! It is a great feeling. I am going to continue on this journey. I need to get the last 5 baby pounds off and I will be me again! But most of all I love feeling good and knowing I am taking better care of myself and my family as a result!